AKI is a complex clinical condition associated with high mortality, morbidity, and health care costs. Despite improvements in methodology and design of clinical trials, and advances in understanding the underlying pathophysiology of rodent AKI, no pharmacologic agent exists for the prevention or treatment of AKI in humans. To address the barriers that affect successful clinical translation of drug targets identified and validated in preclinical animal models of AKI in this patient population, the National Institute of Diabetes and Digestive and Kidney Diseases convened the “AKI Outcomes: Overcoming Barriers in AKI” workshop on February 10–12, 2015. The workshop used a reverse translational medicine approach to identify steps necessary to achieve clinical success. During the workshop, breakout groups were charged first to design feasible, phase 2, proof-of-concept clinical trials for delayed transplant graft function, prevention of AKI (primary prevention), and treatment of AKI (secondary prevention and recovery). Breakout groups then were responsible for identification of preclinical animal models that would replicate the pathophysiology of the phase 2 proof-of-concept patient population, including primary and secondary end points. Breakout groups identified considerable gaps in knowledge regarding human AKI, our understanding of the pathophysiology of AKI in preclinical animal models, and the fidelity of cellular and molecular targets that have been evaluated preclinically to provide information regarding human AKI of various etiologies. The workshop concluded with attendees defining a new path forward to a better understanding of the etiology, pathology, and pathophysiology of human AKI. The lack of effective therapeutic interventions for prevention or treatment of AKI remains a major unmet medical need. AKI has a high mortality rate, and long-term outcomes in those who survive include development of CKD and ESRD. In individuals with preexisting CKD, AKI may accelerate progression to ESRD (1). Thus AKI, once thought to have a benign course in patients who recover, can lead to long-term morbidity, mortality, poor quality of life, and burgeoning health care costs (1). In February of 2015, the National Institute of Diabetes and Digestive and Kidney Diseases (NIDDK) convened the “AKI Outcomes: Overcoming Barriers in AKI” workshop at the National Institutes of Health (NIH). The workshop aimed to integrate and advance collective efforts of the AKI community (2–5) by developing an overarching research strategy to facilitate development and testing of therapies that may meaningfully improve clinical outcomes of AKI. This multidisciplinary meeting brought together clinicians, basic scientists, clinical trialists, and representatives from the US Food and Drug Administration (FDA) and industry. Presenters reviewed current AKI research and participants recommended needed changes regarding pathophysiologic targets, animal models, and clinical trial designs for AKI (6). Importantly, a reverse translational medicine approach laid the foundation for the meeting. In contrast to the linear sequence of preclinical activities historically performed for drug discovery and specifically for AKI (i.e., identifying biologic targets, evaluating target modulators in animal models, and if successful, evaluating a drug in human phase 1 safety and phase 2 proof-of-concept clinical studies), workshop participants proceeded backward, first defining needed clinical trial designs by considering the specific patient population, and then the resulting primary and secondary end points. Subsequently, participants identified the animal model to replicate this patient population. By working backward, participants uncovered considerable gaps in our understanding of human AKI, and of the relevance of AKI animal models and common biologic targets, thereby paving the way for improvements in clinical translation (Figure 1). Working backward iteratively to chart a path forward. In contrast to the traditional, linear approach to preclinical drug development (A), participants at the NIDDK “AKI Outcomes: Overcoming Barriers in AKI” workshop charted a path forward by starting with the ultimate goal: the necessary clinical trials (B). Participants considered first the specific patient population of interest, and then the resulting relevant human pathophysiology, including primary and secondary end points needed for such a study. Subsequently, participants identified the animal model that would replicate this patient population. By working backward, participants were able to identify considerable gaps in our knowledge and understanding of human AKI, and the relevance of AKI animal models and common biologic targets. Proposed gaps that were discussed by workshop participants are highlighted with question marks. Identification of endophenotypes may allow treatments to be tailored to patients who have the best chance of response to a therapeutic intervention. 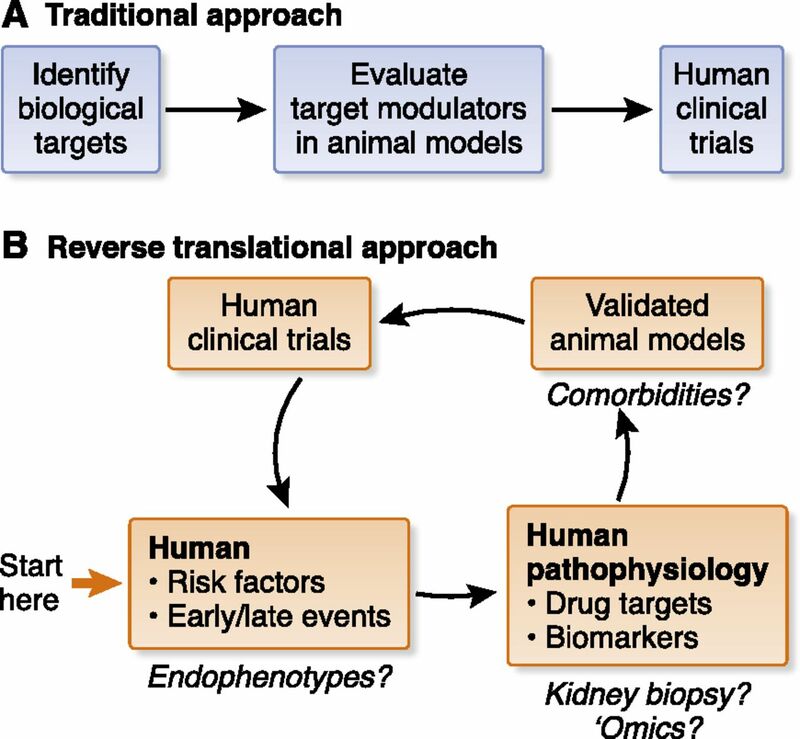 Kidney biopsy and advanced omics technologies for patient sample evaluations may allow for the identification of novel biologic targets and pathways, and provide important information on the fidelity of animal models, which can be fine-tuned to include comorbidities to more faithfully mimic the patient population. The workshop included speakers from clinical areas unrelated to AKI, where researchers had successfully addressed challenges similar to those faced by the AKI research community. Breakout sessions followed, including (1) Delayed Transplant Graft Function, (2) Primary AKI Prevention, (3) Secondary AKI Prevention, and (4) Hastening Recovery. Breakout group topics were selected on the basis of a continued unmet medical need, knowledge gained from clinical studies evaluating treatment strategies—many of which have provided mixed results (7)—and the availability of existing animal models (4,8,9). During the first of three sessions, each group identified one or two relevant, feasible, human phase 2 clinical trial designs. During session two, breakout groups proposed one or more proof-of-concept animal studies, on the basis of human clinical considerations. During session three, breakout groups finalized recommendations and outlined the necessary preclinical and clinical studies. Key points and recommendations were presented during the final session and are highlighted below. Table 1 summarizes the challenges considered by each breakout group and the resulting recommendations. The patient population and associated clinical end points for phase 2 proof-of-concept clinical studies are provided in Table 2. The Delayed Graft Function group focused on several important issues in the transplantation setting that have contributed to the absence of successful treatment for delayed graft function, despite its apparent increased rate in the United States (10). Delayed graft function, the manifestation of AKI after transplantation, is a barrier to allograft survival and is associated with complications, including acute rejection and chronic allograft nephropathy (10). In high-risk delayed graft function patients, therapeutic intervention should occur in the operating room before reperfusion or, for early delayed graft function patients, within 24 hours after transplantation before these complications occur. As evidence of delayed graft function was identified as the most important outcome, the group recommended a more consistent and objective definition of delayed graft function be developed, rather than using a clinical definition that relies on the subjective decision to dialyze a patient after transplantation. The definition specified by the United Network for Organ Sharing (UNOS), dialysis within 7 days of transplantation, should be refined to require either a shorter time frame regarding need for dialysis, or a change in kidney function. Creatinine-based definitions of delayed graft function are more objective and may be better predictors of graft failure (11). Recommendations to enhance the fidelity of delayed graft function animal models to the human condition also were considered and are summarized in Table 1. Lastly, the need to develop a central repository of biologic samples to catalyze progress was emphasized. Because human transplant AKI is poorly understood, the repository should include biopsy, urine, and blood samples linked to clinical data. Such a repository would enable characterization of the natural history of delayed graft function by relating histology, tissue RNA levels, data from various tissue “omic” approaches, and kidney function. Clinical data from donors and recipients are available through UNOS and could be included in a repository. Multiple existing biorepositories also could support these efforts (12–14). The Primary Prevention group addressed the challenges of prevention studies and key research needs that have hindered therapeutic translation. Coronary artery bypass grafting and pediatric cardiac surgery have been attractive groups for study, but their complex pathophysiologies, which are incompletely understood (15), and preclinical efficacy studies, which have largely been performed using models of kidney ischemia–reperfusion injury that poorly model the pathophysiology of human cardiac surgery–associated AKI (9,16), have impeded evaluation. Moreover, interventions attempted in patients undergoing coronary artery bypass grafting have often failed (7), despite good evidence of in vivo efficacy in preclinical models of kidney ischemia reperfusion injury (9). Crush injury in a natural disaster setting was also suggested as attractive for study, but may not be feasible because of the clinical trial resource requirements under these conditions. In light of these challenges, the group focused on cisplatin nephrotoxicity in older patients with head, neck, or lung cancer, where severe kidney dysfunction as a complication occurs in as many as 20% of patients despite commonly used prophylactic hydration strategies (17), and percutaneous coronary intervention (PCI). Cisplatin nephrotoxicity is an attractive clinical situation because therapeutic interventions that prevent AKI may allow patients to complete their course of chemotherapy, providing alternative and clinically significant end points. PCI is a common procedure, and AKI is frequent in high-risk populations and can be modeled experimentally (18,19). Clinical end points for phase 2 proof-of-concept studies in each population and considerations regarding each patient group are provided in Table 2. Developing and refining appropriate animal models for both situations were discussed (Table 1) (20,21), as was obtaining tissue for molecular profiling using current omics technologies. Biomarkers emerging from such studies could help develop tools to stratify patient groups, as well as to identify novel targets for study in animals. Research evaluating molecular targets in animal models should include well designed, blinded, and appropriately powered dose-response studies that pay close attention to strain background, diet, and other relevant variables (4,6,9). The Secondary Prevention group defined secondary prevention as intervention after clinical insult (or initiation of kidney injury), given to shorten the course and decrease severity of the injury. Several clinical settings were considered (e.g., vascular surgery, nephrotoxicity, rhabdomyolysis). The group focused on postcardiac surgery and sepsis because they are common clinical situations that provide an opportunity to explore different approaches to study design (Table 2). Ultimately, the discussion emphasized AKI subtypes or “endophenotypes,” on the basis of clinical features, comorbidities, genetics, biomarker expression, and/or population-specific factors. Endophenotypes have been defined in acute respiratory distress syndrome (ARDS) (22) and, more recently, in SLE (23). Distinct gene expression patterns in AKI due to intrinsic kidney injury versus volume depletion (24) suggest the presence of AKI endophenotypes, which may respond to a single therapy or require multiple, targeted drugs (Figure 2). Use of AKI endophenotypes could help to precisely define and enrich the patient population for phase 2 proof-of-concept studies, potentially improving enrollment, decreasing costs, and increasing the likelihood of clinical success. Potential endophenotypes could be on the basis of clinical features, comorbidities, genetic factors, biomarker expression, or population-specific factors (Table 2). As the timing of therapeutic intervention after clinical insult is critical for successful phase 3 clinical trials, there is a need to develop a point-of-care device that measures real-time change in GFR, acknowledging that serum creatinine concentration is an imperfect clinical trials tool and a relatively poor measure of GFR (25). The Secondary Prevention group also focused on strategies to build animal models reflecting human AKI, acknowledging strengths and limitations of existing models (6,8), and the need for human data to guide improvements (Table 1) (26). Model of traditional versus endophenotypic approaches to drug development in AKI. (A) The traditional model of pharmacotherapy in AKI has focused on development of a single therapy that would be provided to all patients with AKI or all patients at risk for AKI. Endophenotypic models of drug development in AKI acknowledge subtypes of AKI that may require treatment with different therapies targeting unique disease pathways. (B) Early endophenotypic approaches may be on the basis of clinical parameters such as underlying etiology (e.g., prerenal azotemia versus ATN versus obstruction; oliguric versus nonoliguric ATN) or stage of disease. (C) As our understanding of disease pathways in AKI improves, future endophenotypic approaches may incorporate biopsy, biomarker, and omics results that indicate differences in pathophysiologic mechanisms of AKI on the basis of a variety of factors, including genetics, gene and protein expression, and environmental exposures, among others. The Hasten Recovery group addressed the challenges assessing kidney recovery and functional reserve. The presence and extent of kidney functional reserve may affect the ability to define kidney recovery. Difficulties evaluating kidney functional reserve in clinical settings prevent clinicians from knowing if or when patients will achieve full recovery. Thus, improved understanding of kidney functional reserve and kidney recovery are needed, including widespread development and use of methods to assess both. Two patient populations were proposed for use in phase 2 proof-of-concept studies: septic patients with relatively normal baseline kidney function who recover from AKI, and cardiac surgery patients with AKI superimposed on CKD (Table 2). Study of the former may maximize the likelihood of detecting a signal for efficacy of a therapeutic intervention, despite consistent failures of clinical trials in this population (27). For cardiac surgery patients with AKI superimposed on CKD, therapy should be administered as close to the time of injury as possible because modifying the AKI may modify recovery. Developing ischemic and septic AKI models that include comorbidities was emphasized, as were models of hypotension and “stuttering” disease. Several important issues emerged across all breakout groups, and are discussed below. A major barrier in AKI research is lack of a comprehensive, longitudinal understanding of the trajectories of the human disease. This is further complicated by patient and systemic disease heterogeneity, even in the most common clinical AKI syndrome, acute tubular necrosis. Thus, lack of kidney biopsy tissue from a wide variety of patients with well characterized AKI is an important hurdle impeding progress in the development of animal models and the identification of therapeutic targets (9). Obtaining and interrogating tissue samples to understand biologic targets and pathways is critical (Figure 3). With sufficient tissue and advanced omics approaches (i.e., transcriptomics, proteomics, genomics, epigenetics, metabolomics)—coupled with analyses of blood and urine and the appropriate bioinformatic and biostatistical inputs—a complicated disease such as AKI may be categorized into endophenotypes, potentially enriching clinical trials with patients who have a better chance to respond to a particular treatment (22). Molecular and physiologic pathways and barriers to clinical success preventing and treating AKI. The current state of AKI care is characterized by a high mortality rate, increased risk for CKD, and a lack of effective therapeutic interventions. Achieving clinical success in preventing and treating AKI will require interrogation of biosamples to probe AKI pathophysiology, identification of preclinical targets and animal models, as well as evaluation of targets in such in vivo models. If successful, these steps may lead to phase 1 and 2 trials to test novel therapeutics across AKI endophenotypes. Additionally, key barriers—including poor current understanding of human AKI, poor fidelity of existing animal models, and lack of known molecular targets—must be overcome. A clinical research network is a potential solution to help achieve these goals and overcome barriers. POC, proof-of-concept. Although existing animal models have yielded advances in the study of AKI (Table 1), the AKI research community must identify novel pathways, animal models, and targets to fill the AKI therapeutic pipeline. Concerns persist that existing rodent models may have limited relevance to specific human AKI syndromes (e.g., lack of comorbidities, absence of mechanical ventilation or cardiopulmonary arrest) and, in the case of some therapeutics, rodent models may have different underlying biology from humans (4,16). Novel and existing preclinical animal models should be optimized on the basis of an understanding of human AKI, including its endophenotypes and disease stages, and should incorporate comorbidities common in patients, including age (9,28). Indeed, some of the challenges with the application of rodent models to humans may stem from investigators inappropriately extrapolating a therapeutic effect in an animal with a “young” anatomy and physiology to a patient with “old” unresponsive vasculature and senescent epithelial cells. AKI animal models should be credentialed against patient populations proposed for phase 2 proof-of-concept studies by evaluating histopathology, analyzing biomarkers in blood, tissue, and urine, and measuring expression of protein and mRNA to better understand similarities and differences in mechanisms driving disease between patients and models. Targets and pathways should be evaluated in animal models and patients to assess whether they are modulated by disease and to determine primary drivers of disease pathogenesis. The ideal approach would be an iterative process, with animal models fine-tuned as new information regarding human AKI emerges. Specifically, human data can inform animal models by defining the status of the epithelium and endothelial cells and by providing insight into the various effects on these cells in human AKI; information which can then serve as a guide to recapitulating the effects in animals. Moreover, preclinical studies should be rigorously designed and executed, incorporating proposed approaches (4) to avoid false positives, enhance reproducibility, and build confidence in the data supporting a therapeutic target before moving into human studies. The development of animal models and execution of preclinical studies as described, however, may engender intrinsic challenges and hurdles (29), and translation may not be possible for particular animal models and clinical syndromes. As research cost and complexity increase, more resources and expertise (technical, scientific, and administrative) will be needed, requiring academia, industry, funding organizations, and regulatory agencies to work together to achieve common therapeutic goals. The heterogeneity of AKI endophenotypes needs to be defined and risk factors, outcomes and quality of life for each endophenotype must be studied. Identification of AKI endophenotypes or subtypes may be a first step toward tailoring therapies to patients who have the highest probability of response to a new treatment. Endophenotypes in AKI representing two common, but disparate clinical syndromes—AKI due to volume depletion and AKI due to intrinsic kidney injury—have been validated on the basis of unique transcriptional programs (24). A potential model for the further development of endophenotypes might be found in experience with clinically complex, heterogeneous syndromes where endophenotyping has been successfully applied, such as ARDS. The ARDS Network has conducted multicenter clinical trials of ARDS treatments to improve patient care (30). Capitalizing on clinical and biologic data from these trials, investigators successfully identified ARDS endophenotypes using latent class modeling (22), which identifies otherwise unobservable disease subgroups within a population. In two randomized, clinical trials of ARDS, response to treatment differed on the basis of the endophenotype (22). Endophenotypes have also been identified in asthma (31) and recently in SLE (23), allowing customized treatment approaches. A clinical research network could be founded to solve a problem (i.e., tissue availability as a major barrier) rather than to answer a specific question. This network could enable key stakeholders to collaboratively draw on each other’s expertise and establish the necessary infrastructure to advance the field. Moreover, such a network could create new lines of communication among academia, industry, the NIH, and the FDA, and might benefit from the experiences of other established NIH-funded networks (30,32,33). Acknowledging several of the research needs, challenges, and issues identified at this workshop, the NIDDK has committed resources to the Kidney Precision Medicine Project (KPMP) for 2017, which will address many of these goals (Funding Opportunity Announcement Numbers: RFA-DK-16–026, RFA-DK-16–027, RFA-DK-16–028) (34). The KPMP will obtain kidney biopsy samples from patients with AKI (and CKD) under the highest ethical and safety standards. These tissue samples will then be interrogated to determine disease subgroups, generate a kidney tissue atlas that will catalog the various cell types and interstitial components within the kidney, and elucidate relevant pathways to yield promising drug targets. Rapid and unimpeded data sharing with the entire AKI research community will be a key priority, and the NIDDK will regularly solicit proposals for ancillary studies to the KPMP to ensure that KPMP samples generate the maximum benefit to advance AKI research (34). Human targets and pathways identified by KPMP and other future efforts will need to be validated in well controlled animal studies to demonstrate a causal link between the molecular target or critical pathway and AKI. Animal models could then be created for preclinical proof-of-concept testing of novel therapeutics on the basis of mimicry of these human effects. To identify drivers of disease pathogenesis rather than targets and pathways modulated as a consequence of disease, it will be important to collect early biopsy samples from patients with AKI in order to develop the most effective therapeutic interventions. In summary, a strong desire and need exists to understand human AKI as a first step to reconfigure the translational pipeline so that researchers and clinicians could have confidence in predicting the effectiveness of proposed therapeutic and preventive strategies in patients with AKI. The overarching tools and resources that were discussed are summarized in Figures 1 and 3. What began as an effort to identify solutions to overcome the barriers impeding research translation (Figure 4) has yielded a path forward for the field of AKI. Obtaining kidney biopsy samples from patients with AKI to investigate its epidemiology, pathology, and pathophysiology is a priority. The most informative relevant information obtained from human AKI may well derive from early biopsy specimens of patients, so that findings will most closely be in the causal pathway rather than a consequence of damage. By first maximizing our knowledge of human AKI, animal models might be refined or constructed to improve fidelity to human disease (6,33,35,36). Moreover, understanding human AKI and modeling it preclinically by iterative processes and using human tissue may allow the discovery of novel biologic pathways and targets, reinvigorating and enhancing the translational pipeline for drug development (34). Improving the confidence of target and drug selection will likely require development of companion biomarkers that discern target engagement to aid dose selection and individualize therapy. Reaching improved AKI outcomes: the drug development journey. No effective treatments currently exist for AKI. A journey to achieve breakthroughs in AKI drug development requires involvement of academia, industry, the US Food and Drug Administration (FDA) and the National Institutes of Health (NIH), among others. Collaboration among these “travelers” may facilitate drug development. The Kidney Precision Medicine Project (KPMP) and other research efforts will improve our understanding of AKI, enabling identification of disease pathways and drug targets, thereby expanding the “roadway” of opportunities for drug development. Although identification of novel disease pathways, completion of successful animal studies, creation of improved animal models, and development of clinical research networks may enable more rapid advances, the process may be impeded by toxic effects of therapies in animals, challenges identifying patients to enroll in trials, or drug side effects, among other issues. Ultimately, reaching the destination of improved AKI outcomes will require execution of a successful human drug trial and approval of that therapy by the FDA. However, a failed human trial—even after much of the road has successfully been traversed—may send the travelers on a detour back to the start, with only some lessons learned to show for their journey. HOV, high occupancy vehicle. To achieve these lofty goals, it will be necessary to establish cohorts, consortia, and networks where key stakeholders (clinicians, basic scientists, clinical trialists, regulators, and industry representatives) partner to address important barriers that have hindered clinical success. Infrastructure to curate, compile, and analyze data generated from omics approaches and histology must be developed so actionable insights into the pathogenesis of human AKI can be obtained. The continued failure to clinically translate promising agents to patients with AKI is an urgent call to action. Collectively, these solutions and steps may renew interest in AKI as a therapeutic area among academia, industry, and biotechnology companies. A.Z. is employed by Akebia Therapeutics Inc. S.K. is employed by Quark Pharmaceuticals. L.D. is employed by GlaxoSmithKline. We would like to acknowledge the leaders of the breakout groups as follows. Delayed Transplant Graft Function group: L.F., F.E.H., S.K., D.B.M., and L.D. Primary Prevention group: L.C., M.d.C., J.S.K., and B.T.T. Secondary Prevention group: A.A., T.G., M.D.O., and P.M.P. Hasten Recovery group: J.V.B., L.M.D., and K.D.L.